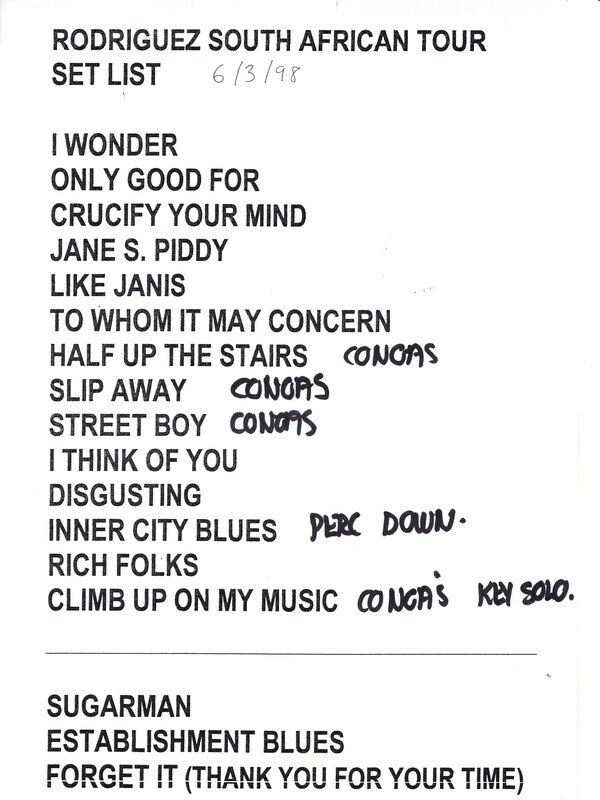 Here is a scan of the planned set list from the sound engineer’s mixing desk; compare this to what was actually played! 70s (and 80s and, it seems 90s) folk-rock “icon” Sixto Rodriguez played his first South African performance live at the Bellville Velodrome on Friday, 6 March 1998. “He’s really alive!” were the words on more than one nostalgic fan’s lips as a crowd of over 2 000 listened to Rodriguez’s first ever live performance in South Africa – and his first appearance on stage in 18 years. The “Sugar Man” enthralled from the first, instantly recognisable, notes of “I Wonder” through to the much requested and long-awaited “The Establishment Blues”. South African Music Association “Best Album” winners Big Sky ably supported the visitor, with Willem Möller’s electric guitar providing a focus during the simpler musical songs, with Russel Taylor’s hammond and Graeme Currie’s bass underpinning the set. Rodriguez was visibly moved by the audience’s enthusiastic response, chanting his name between every song, and with a round of applause and calls of “Rodriguez we love you” following each song. The Mexican American revealed a refreshingly contrasting “superstar attitude” to other recent international visitors, repeatedly bowing and thanking both band and audience. At one point the singer called for silence, in his unmistakable voice said, “A picture” and stepped back, miming the action of taking a huge snapshot of his fans. Ranging in age from 16 to 50-plus, those fans sang along to most tunes, with nostalgia and youthful idealism in equal measure as the older remembered their upstart 70s youth and the younger drew on the libertarian lyrics and social commentary as idealistic focus inspiration. Finishing the one-and-a-half hour set, Rodriguez was briefly visible on a parapet leading to the dressing rooms, and waved a final farewell to the ecstatic crowd. After the concert, he shook hands with, and personally thanked the hundred-or-so VIP guests, eagerly and animatedly signing autographs, engaging with stories of when and where people had listened to his albums and impressing everyone with his warmth and sincerity. Many left the concert with plans to purchase a second ticket for Saturday night’s performance. 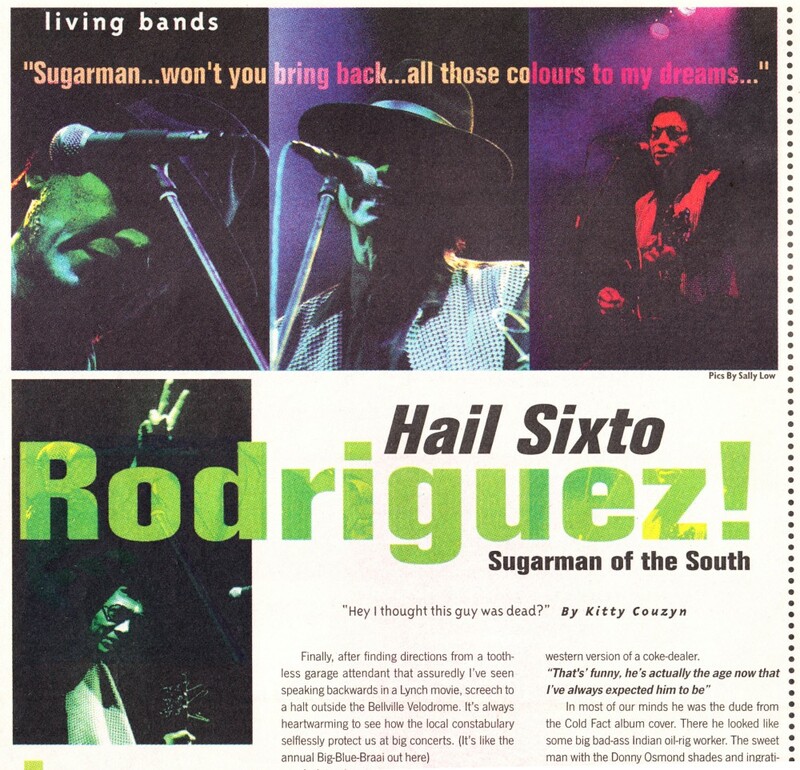 This review was also published with a few changes in the Sunday Argus on the 8th March 1998 under the title: “Sugar Man” Rodriguez sings it to adoring crowd. As the crowd waited and the news of his shyness filtered out to the four thousand odd devotees, a chant begun. Rodriguez! Rodriguez! Rodriguez! We were all gently encouraging the dude that virtually defined our hey-shoo-wow contemplate-the-universe and overindulge-in-giggle-twig-years. Finally there he was. The Bob Dylan of the Southern Hemisphere, the green poet of our generation. The deliciously anti-establishment prophet of the grey-pit in which we currently reside.He’s dressed in a tie, black shirt and squiggly-print waist coat like some caricatured spaghetti-western version of a coke-dealer. Then began the singing. There it was, that golden voice. After twenty years, like it was mellowed in casks of oak – if anything, more rich and golden. The only way to describe the tidal wave of emotion that erupted is with gratuitous exploitation of expletives and superlatives. Unbelievable! Awesome! Shivers up a thousand spines! One of, if not the best concerts ever in Cape Town. Everyone, knew every word. No, you don’t understand. Every! Word! At one point, the man faltered on a verse and the crowd calmly kept on singing, lifting him back onto the melody like a nurturing mother on the day of her baby’s first steps. What made the whole scene specially touching was the transparency of his true amazement. Imagine going to an obscure country that you’ve never seen before, just to find there are thousands of people who still adore you, for songs you sung in your youth. He was literally a resurrected angel for two mightily special hours. The encore would have gone on all night if they had been allowed to. At the after-party, the buzz was just soooo infectious. He signed autographs and graciously met all those who wanted to shake his hand. I am Twenty-seven and like to think of myself as beyond the sycophantic irritation stage. But this I had to be part of. Everyone in that room had dreams of Rodriguez taking over America – a resurrection supreme. Some sadly doubted the reality, I for one believe wholeheartedly that Rodriguez could storm the Grammies in 1999. If we have anything to do with it, he will. Now give us your sunglasses!